Visible crew/equipment: After Roy and Johnny pick up supplies at the nurses' station, they walk down the hallway and stop midway to talk about Johnny's insomnia. 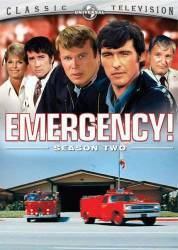 After speaking a few moments, Johnny and Roy head for the exit, so the camera follows them without cutting away, and when a father and son enter the hospital the camera turns, without cutting away, and follows them up the hallway. 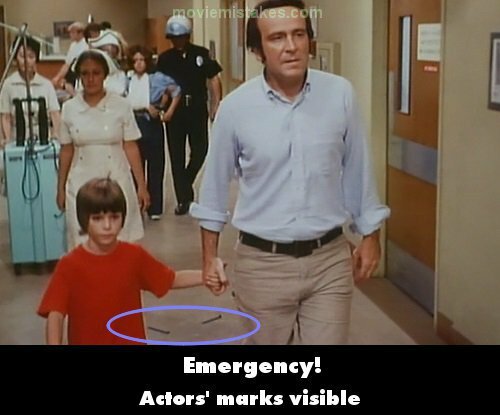 Just before the father and son reach the nurses' station, the actors' two black tape mark are visible on the floor behind them, precisely where Roy and Johnny had been speaking.